Lease and Release dated 1st & 2nd April 33rd year George 111, 1793. Between Henry Allen of Talgarth, Brecon Esquire, eldest son and heir at law of Edward Allen late of The Lodge (Brecon) Esquire deceased and Eneas Walter of Clifford yeoman. Consideration £280 for sale of fee simple. Adds that the premises “are part of a certain Messuage and farm called the Pykes and which the said Edward Allen late of The Lodge aforesaid but then of the Town of Hay …. Brecon …. purchased of Walter Jeffreys of the town of Brecon …. esquire and which descended to the said Henry Allen ….. as heir at Law to Edward Allen”. Extract from the Will of Eneas Walter dated 6th Feb 1812. EW left “all that Messuage and Tenement or Dwelling house & Premises called the Pikes” to his sister Hester Jones wife of Thomas Jones “independent of her husband” for her life and after her decease to his nephew Eneas Jones his heirs and Assigns for ever (subject to payment of £160 to his niece Charlotte Jones when she marries with Executors consent or £8 pa if without consent). Richard Weaver Watkins of Hay appointed as executor. From the Stamp Duty papers regarding the £160 it is stated that EW died on 21st April 1812 and probate was granted in Canterbury in Sept 1812. From the Release of the Legacy dated 16 Nov 1830, it is stated that it is charged on “certain Lands and premises called the Pikes”. Will of Sarah Beavan of Priorywood Clifford wife of Hugh Beavan Gent 10th Feb 1815. Reference is made to a Deed of Appointment 6th Oct 1804 between HB & SB and Samuel Beavan and to an Indenture 28th March 1775 between the same parties. SB left freehold property in Michaelchurch Escley to Samuel Beavan, no description or name, then in the possession of HB and his tenants, to hold in Trust to SB & HB during their lives and proceeds divided between family with balance to HB. SB signed with an “X”. Will of Sarah Woodhill 31st March 1827. Thomas Allen and John Mainwaring were executors. Release of a Legacy, dated 16 Nov 1830. Between John Beavan of Crasswall [Craswall] farmer and Charlotte Beavan his wife formerly Charlotte Jones the beneficiary of the legacy; Richard Weaver Watkins executor of Eneas Walter and Aneas Jones of Chapel House, Michaelchurch Escley [in Nov 1830 document, Eneas Jones is of Chapel House, Craswall] yeoman. Reciting that Aneas Walter in his will left to his sister Hesther Jones since deceased wife of Thomas Jones “all that messuage tenement or dwelling house and premises called the Pikes” in Michaelchurch Escley for her life and then to his nephew the said Eneas Jones subject to a payment of £160 to his niece the said Charlotte Beavan on marriage to an approved person. Reciting that Charlotte Beavan has since married John Beavan with such approval. Eneas Jones pays the said £160 and John & Charlotte Beavan release him and the property from the debt. Ref to a mortgage by EJ to RWW 1825. Lease and Release dated 22nd /23rd Nov 1830. Between Eneas Jones of Chapel House Crasswall farmer and Richard Weaver Watkins of Hay of one part and John Motley of Bredwardine yeoman of the other. For consideration of 5s to each of EJ and RWW they sell to JM “all that messuage or tenement and dwelling house with the beasthouse wainhouse and other outbuildings thereunto belonging commonly called or known by the name of the Pykes And also all those two fields closes and pieces or parcels of land one whereof is called or known by the name of the Birches and contains ten acres and three roods..... and the other whereof is called or known by the name of Cae Garrett and contains nine acres and three roods…. Which last mentioned pieces of land” were comprised in the Lease and Release of 1st and 2nd April 1793 between Henry Allen and Eneas Walter. All which said messuage etc are now in the possession or occupation of Timothy Howard as tenant. Between Eneas Jones of Chapel House Crasswall nephew and devisee of Eneas Walter late of Bwlch and Anne his wife of first part, Richard Weaver Watkins gent. of Hay of second part, John Motley yeoman of Bredwardine of third part, Thomas Allen schoolmaster of Bredwardine of fourth part and Richard Pemberton gent. of Hay of fifth part. Reciting that at the time of his will Eneas Walter held fee simple in the premises hereinafter described which he left to Hester his sister and then to Eneas Jones. Reciting a 500 yr mortgage dated 10th Feb 1825 whereby EJ borrowed £120 from RWW currently unpaid and now £136 10s. Reciting that John Motley has agreed to buy the property from Eneas Jones for £395 and pay off the mortgage. The property is described in the same wording as the Lease. Memorandum of Agreement dated 23rd Nov 1830. Between John Motley of Bredwardine yeoman and Caroline his wife and Thomas Allen of Bredwardine schoolmaster. Recites the Nov 1830 Lease and Release. Recites that in consideration of the sum of £390 paid by John Motley to Eneas Jones, EJ sold to JM “all that messuage tenement or dwelling with the beasthouse wainhouse and other outbuildings thereunto belonging commonly called or known by the name of the Pikes And also all those two fields closes or parcels of land……one whereof is called or known by the name of the Birches and the other whereof is called or known by the name of Cae Garrett”. Recites that Thomas Allen held £200 on trust for Caroline Motley and paid the money to them. Now agreed that Thomas Allen will hold the title deeds as security. Final Agreement dated 8th Jan 1833. Between Thomas Jones plaintive and numerous others including John Bird and Samuel Beavan defendants. Property described as “One messuage one cottage one Barn one stable one Beasthouse one Yard one Garden four acres of Land five acres of meadow twenty acres of pasture three acres of wood & underwood four acres of furze & heather & common of pasture for all manner of cattle…in Michaelchurch Escley”. Lease and Release dated 1st & 2nd March 1833. Between John Bird gent eldest son & heir of Susanne Bird plus Samuel Beavan Esq grandson & heir of Samuel Beavan plus other Beavan descendents of the one part and Thomas Jones of Dorston [Dorstone] gent. of the other. Lease for 1 yr at a peppercorn. Statement by Sarah Man spinster 1st March 1833. Refers to a Deed of Appointment 6th Oct 1804 now lost, between Hugh Beavan gent and Sarah his wife both now deceased of one part and Samuel Beavan the elder Esq of the other, for the consideration therein mentioned all that “messuage or cottage & lands with the appurtenances now and for many years past commonly & known by the name of Sunny Bank or otherwise the Little Pikes lying together and containing by estimation 15 acres ….. from River Escley on the south to the Hill or Common called the Vagar hill on the north having a highway leading from Llanrosser to the said Hill or common on the west and lands called the Pikes lately belonging to Eneas Walter deceased & now to [blank] [?Woodhill] on the east part or side thereof and also all that piece or parcel of rough pasture land called Cea Cydrech containing by estimation 20 acres & usually held & occupied with the said cottage & lands called Sunny Bank having lands of Henry Allen Esquire & lands belonging to the Greegloye [?Grigland] Farm on the south & west & the said Hill or common then called the vagar hill on all other parts or sides thereof” all in Michaelchurch Escely formerly in the tenure or occupation of James Morgan afterwards of the said Hugh Beavan since of Timothy Howard & William Williams successively & now of W Thomas Jones. The property was assured to the use of said Hugh and Sarah Beavan for their lives. Sarah died 1816, Hugh died May 1822. Susannah Bird widow since deceased held a mortgage on the property at time of Sarah’s death of £130. Sarah Man and others are entitled to proceeds from sale to Thomas Jones at £350 of which first £130 is due to representatives of Susannah Bird. Due to the loss of the Deed, £50 is to be paid to others to join in the sale agreement which means the legacies left by Sarah Beavan have been agreed to be adjusted. 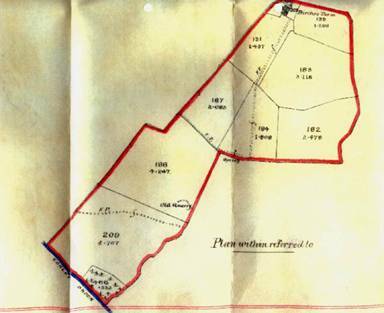 Lands – “messuage or tenement & dwelling house with the Beasthouse wainhouse and other buildings thereunto belonging commonly called or known by the name of The Pikes” plus Birches 10acres 3 roods and Cae Garrett 9 acres 3 roods which are the 1793 sale by Henry Allen. Late in the occupation of Thomas Stephens but now John Motley. Further mortgage from Thomas Allen to John Motley and wife and Sarah Motley, John Powell and wife and Caroline Motley for £200. Same lands as April 1844 but Cae Garrett contains only 4 acres 3 roods. Occupation Thomas Stephens, then John Motley “but now of Pikey Samuel Jones”. Transfer of Mortgage 30th Nov 1850. Between Anne Williams of Llowes Radnor widow of John Williams, John Motley of Peterchurch farmer and William Gabb of Peterchurch Gent & Sarah his wife. William Gabb has agreed to buy premises from John Motley for £450; John Williams mortgage will be paid off. Premises – Pikes, Birches, Cae Garrett as before. Late in occupation of (blank) but now William Gabb whose wife Sarah was formerly Motley. Succession Duty Assessment dated 1st July 1856. On the death of Thomas Jones 22nd May 1853. A messuage Tenement and Lands with the appurtenances called The Little Pikes in Michaelchurch Escley in the occupation of [blank] Price at the yearly rental of £18. Saleable value stated as £300 and annual value £18. Memorandum dated 12th Nov 1857. Statement by William Gabb that he has deposited in the National Provincial Bank at Hay the Deeds relating to a farm and lands called Pikes otherwise Birches as collateral security for a sum of £100. Between William Gabb of Birches Michaelchurch Escley Gent & wife Sarah and Samuel Lewis of Trewan, Llanfihangel Nantmellan, Radnor farmer. Mortgage of £200 from SL to W/SG. In occupation of WG; premises all as 1854. Conveyance dated 5th August 1863. Between Samuel Lewis on behalf of Wm Gabb of Michaelchurch Escley yeoman under a petition for bankruptcy and William Gabb now of Peterchurch and now bankrupt. By a petition for bankruptcy filed 24th Feb 1862 Wm Gabb was declared bankrupt. William Gabb at this time held a life interest in the property which was filed as valueless and has offered to buy the interest for £10 which SL has accepted. Property is “All that Messuage or Tenement and Dwelling House with the Beasthouse Wainhouse and other Buildings thereunto belonging commonly called and known by the name of The Pikes And also all those two fields and land or parcels of land one whereof is called and known by the name of the Birches and contains 10 acres 3 roods and the other whereof is called Cae Garrett and contains 9 acres all in Michaelchurch Escley…now in the possession or occupation of Samuel Jones as tenant thereof”. Conveyance dated 4th June 1864. Between Samuel Lewis; William & Sarah Gabb of P’church: Arthur Cheese of Hay gent. Recites June 1844 £200 mortgage from Thomas Allen to John Motley and Caroline, Sarah Motley, John Powell and Harriett wife and Caroline Motley. Recites 5th Aug 1863 Samuel Lewis and Wm Gabb and the £10 deal. Recites said Samuel Lewis has contracted with Wm and Sarah Gabb for purchase of fee simple subject to 1844 mortgage and 1858 document – SL to retain the £200 from sale proceeds. Samuel Lewis assigns to Arthur Cheese the principal sum of £200 and subject to further payment of £300 to Wm and Sarah Gabb. Property is same as August 1863. Assignment of mortgaged premises dated 18th Nov 1865. Between Thomas Allen shopkeeper of Staunton and Samuel Lewis farmer of Radnor. Recites 11th Sept 1844 Motley/Powell; 4th June 1864 SL/W Gabb/Cheese whereby property conveyed to Cheese in trust for SL. In consideration of £200 now paid by SL to TA, TA releases SL. Property – Pikes messuage, beasthouse wainhouse and also Birches of 10a 3r and Cae Garrett 4a 3r late in occupation of Thomas Stephens, afterwards John Motley and now Samuel Jones as tenant. Conveyance dated 8th August 1877. Between Jonathan Thomas Davis gent of Preston on Wye and John Price farmer of Llanrossa [?Llanrosser]. Property – building (formerly a messuage or cottage) and lands called Sunny Bank otherwise The Little Pikes…15a; from River Escley on south to Hill called The Eagor Hill on north, having highway from Llanrossa to the Hill on west and lands called the Pikes formerly belonging to Eneas Walter dec’d now or lately [blank] Wooding on east; plus Cae Cydrech 20a [described as before]. Formerly in possession of James Morgan, afterwards Hugh Beavan since of Timothy Howard and William Williams afterwards Thomas Jones and now John Price. Will of Samuel Lewis dated 6th June 1891. Left the Birches in Michaelchurch Escley occupied by Charles Jones in trust for his grand daughter Polly Cox. Probate dated 5th Nov 1891. Conveyance dated 16th Feb 1905. Between Samuel John Lewis farmer of Brilley and Thomas Grafton Sprague bank manager of Kington Executors of Samuel Lewis; and Polly Cox spinster of Manchester. Polly Cox is now 21 and Executors now convey The Birches occupied by Henry Howard to her. Conveyance dated 27th April 1906. Between Polly Cox spinster of Pendleton and Henry William Howard of the Birches Michaelchurch Escley farmer. PC has agreed to sell to HWH for £360 The Birches occupied by the said HWH in fee simple; property as per the plan attached [see above]. Mortgage dated 3rd May 1906, Transfer dated 2nd Nov 1914; Inden Dec 1925. Between HW Howard and Miss ME Jones relating to the Birches 22acres 10 perches in occupation of HWH; £300. Transfer between Miss ME Jones and HWH to Ann Williams and William Lewis. Mortgage now £250. Indenture Dec 1925 principal sum of £250 now due to Annie Ethel Williams. Recites HWH died on 12th Jan 1929 having by his will dated 7th June 1928 appointed his wife Emily Jane Howard sole executrice who paid off the mortgage to Annie Ethel Williams on 3rd Oct 1939. Conveyance dated 24th Nov 1908. Between (1) various Howards the Vendors; (2) mortgagees; (3) Charles Price and James Price latter of Abbey Farm Craswall; (4) Henry William Howard. HWH has agreed to buy the property for £203 11s 6d. Acknowledgment dated 24th Nov 1908. Mr Arthur Price of Griglands farmer to Mr Henry William Howard of Birches. Refers to a document dated 20th July 1899 between Charles and James Price of first part and HWH and other Howards of second plus Dyke/Jones of third part which relates to certain messuage farm lands and hereditaments known as The Pikes, Caecydrech and Penrhoel all in Michaelchurch Escley purchased by AP from Howards in fee simple by an Indenture of even date herewith made between the Howards of first part, Mary Jane Jones and Eva Catherine Wilson Jones of second, Charles and James Price of third and AP of fourth, and also relating to certain lands and hereditaments called Sunny Bank of which the entirety now belongs to HWH in fee simple conveyed by an Indenture of even date hereto. Statutory Declaration dated 24th Nov 1908. By Charles Price of Cwm Farm Peterchurch confirming that his late father John Price of Llanrosser yeoman, will dated 25th Nov 1889 proved 24th Feb 1890 by brother James Price, left all that farm buildings and lands called Pikes, Pensylvania, Pentryhold and Sunny Bank for his daughter Hannah Howard and her children plus a legacy to the children of his daughter Jessie Williams. Declares that £500 was raised by mortgage on the said property from Miss Mary Jane Dyke and Mrs Eva Catherine Wilson Jones dated 20th July 1899 to pay the legacy which is now paid. Mortgage dated 3rd Dec 1908. Between HWH of Birches farmer and Thomas Jones of Pentwyn Michaelchurch Escley farmer. HWH has fee simple in the property; TJ to lend him £150 with interest at 4%. Property as 1908 Conveyance. Abstract of Title of Henry William Howard to Sunnybank dated 1908. Reconveyance dated 7th June 1919. Between Mary Honour Jones of Vowchurch and HWH of Birches Michaelchurch Escley farmer. Recites document is supplemental to mortgage dated 3rd Dec 1908 between HWH and Thomas Jones of Pentwyn Michaelchurch Escley for £150. TJ will dated 8th March 1919, died 19th Mar 1919; mortgage repaid. Mortgage dated 19th June 1919 and Reconveyance dated 18th Nov 1921. £120 plus interest at 5% borrowed by HWH from JH Weale and repaid. Property as Nov 1908. Will of Henry William Howard 7th June 1928. Bequeaths to his wife Emily Jane Howard the farms and lands known as The Birches and Sunnybank. Died 12th Jan 1929 at the Birches. Assent dated 4th Oct 1939. Emily Jane Howard assents to all the property inherited from her husband HWH vesting in herself. Property called The Birches containing 22 acres 10 perches. Mortgage dated 9th Oct 1939 and Release dated 6th Oct 1947. Between Emily Jane Howard of Coedpoth Saint Margarets and National Provincial Bank. Property - messuage farm and lands known as The Birches. Report on Title by Nat’l Prov’l Bank 16th and 19th Oct 1939. The Birches 22 acres 10 perches, Sunnybank otherwise The Little Pikes 15acres 1 rood 12 perches – both good and marketable freehold titles held by Emily Jane Howard of Coedpoth St Margarets. Notes Emily Jane Howard of Coedpoth will dated 5th August 1948 appointed Denzil Gwilliam of The Tanhouse St Margarets and William George Cole of The Bank Michaelchurch Escley as executors. She died 29th May 1964. By an Assent dated 25th Aug 1965, the property was vested in Phyllis Annie Gwilliam of Coedpoth. Property – The Birches and Sunnybank as Oct 1939 title. There are numerous references to Pikes Farm in these papers. One appears to use the description to refer to the two fields sold in 1793. However the other seems to be a reference to the Pikes Farm buildings across the road from Sunnybank. The transactions conflict with other information held by the transcriber as to ownership of Pikes Farm at the time and the anomaly remains to be resolved.